On May 3rd, a hero revealed himself to the masses on Facebook. He didn’t do it for attention or glory but to let people know that he and others like him are there for all of us whether or not they are appreciated for it. The hero’s name is Deon Joseph. Officer Deon Joseph. “The other day a very radical young man asked me how I could look in the mirror and face myself because of what I do for a living. Knowing how indoctrinated he was I ignored his ignorance. Then today I looked in the mirror as I got dressed to police the streets of Skid Row. I know what many think of as I don my uniform. I know as soon as I suit up, I will be hated, I will be taunted, I will be baited, I will be slandered. But that’s okay. I know who I am. In spite of the hate and irrationally of today’s times, I will always be a man of honor, integrity, faith and concern for the people I serve. I don’t need to love me. I just need you to know that if you need my help, regardless of how you feel, I will be there for you, along with most of the 650,000 men and women nation wide who feel the same way. According to his Facebook bio, Officer Joseph has been a police officer in Los Angeles for 19 years – 17 of those years in the area called Skid Row. It takes a special type of person to work an area like that day in and day out and maintain your positive attitude – and your sanity. Working with the homeless, the derelicts, those who have been forgotten by society takes courage and compassion. He takes the job personally. He and his fellow officers developed a program in which they hand out hygiene kits and drug, housing and job information to the people in the area. Together their efforts helped house over 100 homeless people and has helped reduce the overall crime in the are by 40%. Deaths among those people fell by 32% from 2005 – 2009. Officer Joseph’s dedication to duty and to the people of the Skid Row area have earned him numerous awards including a Shelter Partnership Award, the Los Angeles Police Commission Award for Community Service, the California Senate Award for Recognition of Skid Row Achievements, the Top Cop Award for Outstanding Achievement in Law Enforcement, and the Nami LPS Award for Exemplary Service and Dedication for the Mental Health. And that was in 2015 alone. 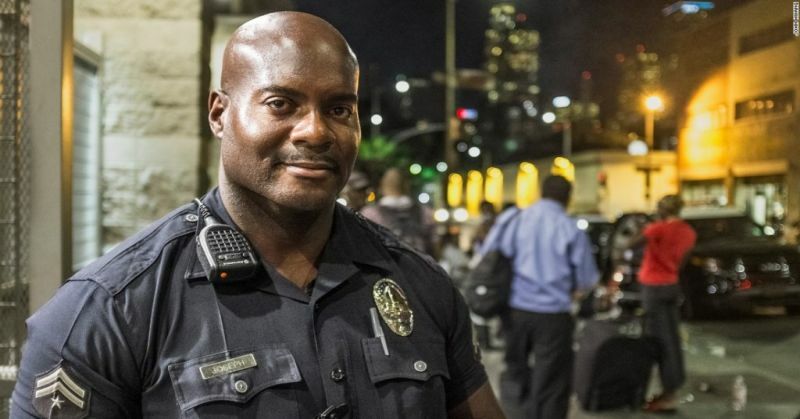 Hats off to this hero who serves the L.A. community above and beyond the call. 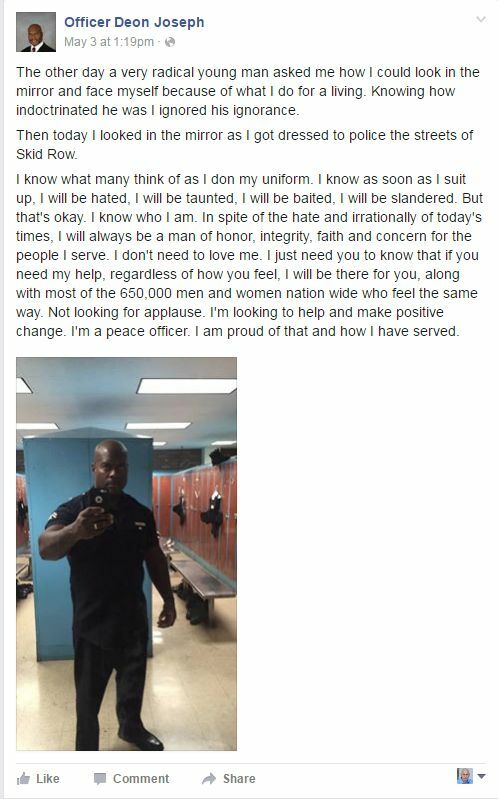 Those who hate police officers won’t know that he makes a difference. But you can bet those on Skid Row know very well.